Black Head is an ancient promontory fort near St Austell in Cornwall, England. Promontory forts are a type of hillfort which make good use of natural defenses such as high cliffs. In this site the defenses have been improved by the construction of a series of ramparts placed across the neck of a spur in order to divide it from the surrounding land. You can see the ditches at the bottom of the aerial plan view on this page. There appear to be at least three banks and ditches across the spur at Blackhead. The ramparts and accompanying ditches formed the main artificial defence, but timber palisades may have been erected along the cliff edges. Access to the interior was via an entrance through the ramparts. Photographers notes: This is a great site in an amazing location on the Cornish coast. 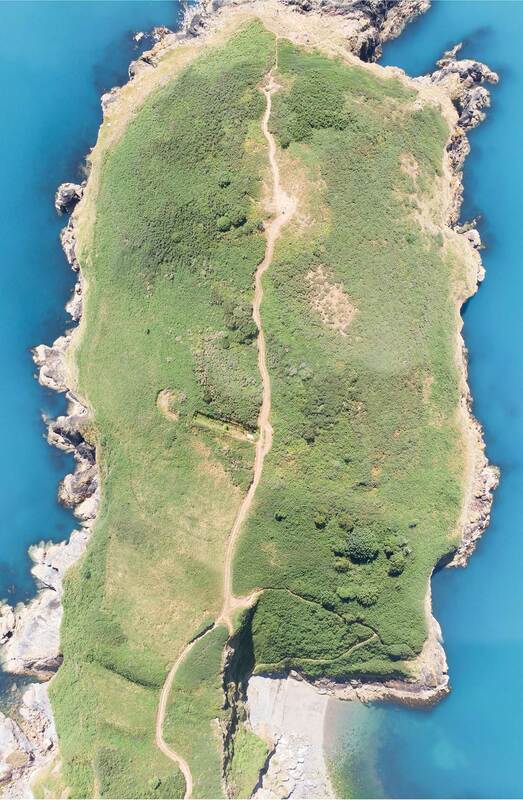 It is easy to get to by walking along the coast path from either direction or across the fields from Trenarren. The only visible defensive banks are at the narrowest point as you walk up the path towards the promontory. There are some later working within the fort which are apparently part of a rifle range from the 1880’s (see below). Worth a visit just for the views down the coast in both directions. Note: This site is not in a no-fly zone but isn’t far from the regulated airspace a few miles off the coast, so you might get on-screen warnings if you fly off the end of the point. Terrain: Coastal grassland and bare rock. Summary: Multivallate promontory fort sited on commanding rocky headland dividing St Austell and Mevagissey Bays. Sea cliffs to the E, S and W. Irregularly-shaped with at least three parallel rampart banks, with partially buried outer ditches to the NW across narrowest part of headland, elsewhere defined by steep natural sea cliffs, enclosing 3.3ha. Outermost rampart slight and ditch almost gone. Central and inner ramparts to 5.2m high with 2.1m deep ditches. Ramparts on W side much mutilated. Site now inaccessible from sea, but coastal erosion substantial since prehistory. Former low field bank traces in interior now not visible. Damaged with original entrance probably on W side. In interior at least one stone hut circle to NNW of recent rifle butts built in 1880’s and modified during 1907 and 1970’s. Many of surviving features associated with this subsequent reuse. Coastal grassland and bare rock. On 1st Ed. OS map (1882). Undated.